When we first heard that Larry Sombke had launched a line of southwestern-inspired sauces, we were like, "Wait... the gardening guy?" Yep, it was the locally-based gardening guru himself. And it turns out he knows how to make some tasty sauce. 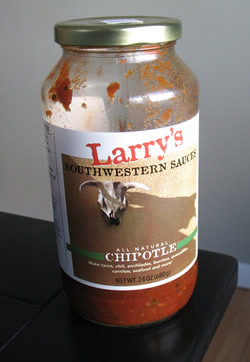 The "Larry's Southwestern Sauces" line currently includes two varieties: ranchero and chipotle. We tried the chipotle. 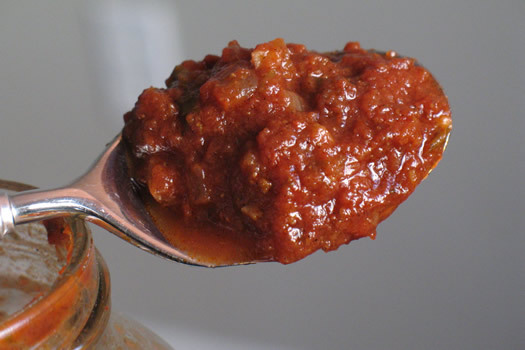 The label on the jar recommends using the sauce with pork or chicken. We ended up including it in a take on huevos rancheros: eggs, the chipotle sauce and roasted root vegetables on a crispy tortilla with a little sour cream and cheese. It was really good, thanks in large part to the way the sauce brought the whole dish together and imparted a round spiciness. As it happens, it shouldn't be surprising that Larry would be responsible for such a tasty product. We found out recently that before the garden guru-ing he was a chef and owned a catering company in the Hamptons. He's also written a handful of cookbooks. Larry's Southwestern Sauces are available at a bunch of locations in the Capital Region, including the Honest Weight Food Co-op and Putnam Market in Saratoga. Disclosures: Both editors are casually acquainted with Larry. We've both hosted radio programs on which he's appeared. And he answered our questions about tomato blight earlier this year. The jar we tasted was bought off the shelf. And if we didn't like it, we wouldn't have said anything. You know, like our mothers taught us. Larry and Larry's Southwestern Sauces can also be found on Saturday's from 9 AM to 1 PM at the Delmar Farmers Market at it's winter location at the Delmar Presbyterian Church, 585 Delaware Ave. He had some excellent Chipolte Chili to sample in the crock pot last weekend.